SCSPE is proud to bring its members valuable discounts on the products and services they need. Take advantage of competitive rates available on UPS® shipping services. 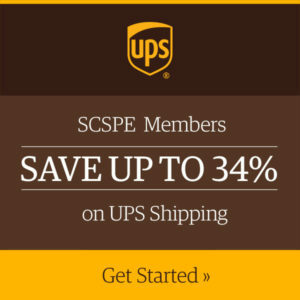 SCSPE members can receive these discounts even if you already have a UPS account. Whether you need your documents or packages to arrive the next day or are looking for an affordable shipping option, UPS understands the importance of speed, reliability, and cost. Plus, the more you ship, the more you can save. Let SCSPE and UPS help your business grow, improve your bottom line and make shipping easier. To enroll and start saving today, visit savewithups.com/scspe. For more information, call 1-800-MEMBERS (1-800-636-2377), M-F, 8 a.m. – 6 p.m. EST. *Visit savewithups.com/scspe for specific services and discounts. Click here for details on Introductory Program discounts.